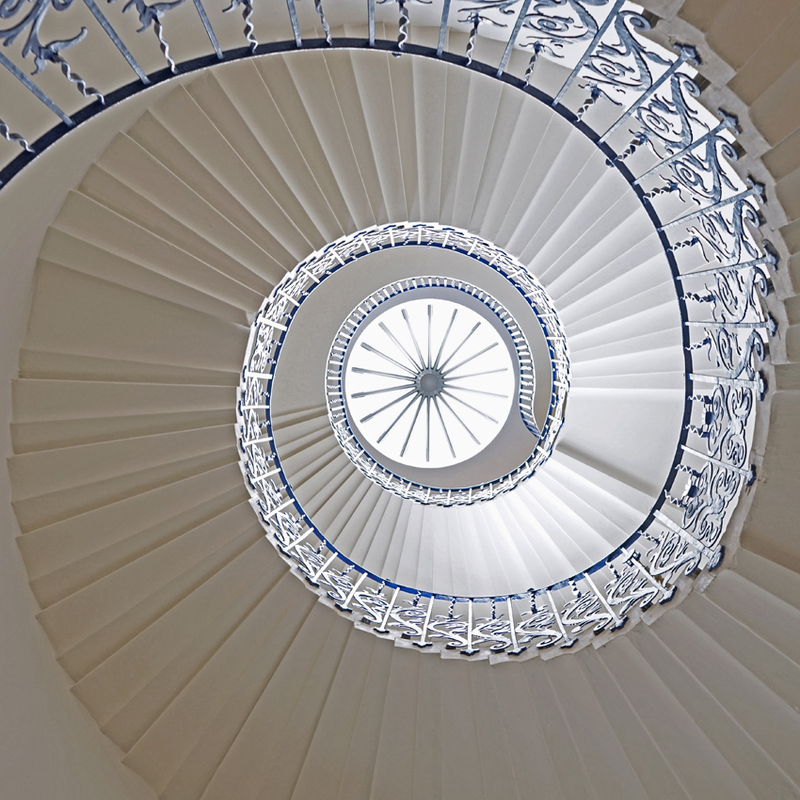 The first geometric, self-supporting spiral staircase in Britain is in the Queen's House, Greenwich. It is 'geometric' because each step supports the stair above: there is no central column. Andrea Palladio, father of the Palladian style of architecture, had described and praised such staircases, 'void in the middle'. 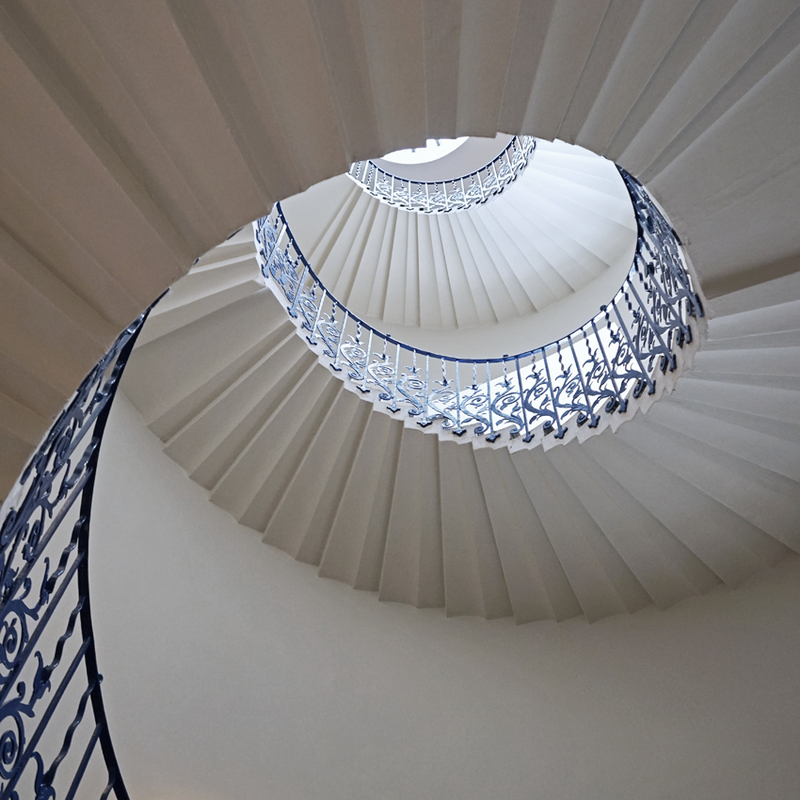 Inigo Jones studied Palladio's work and followed his example in the Queen's House. Nicholas Stone, his mason, introduced a crucial innovation. Rather than relying only on the overlap between steps for support, he also introduced a rebate: a groove along the bottom of the riser, also known as an 'interlock'. 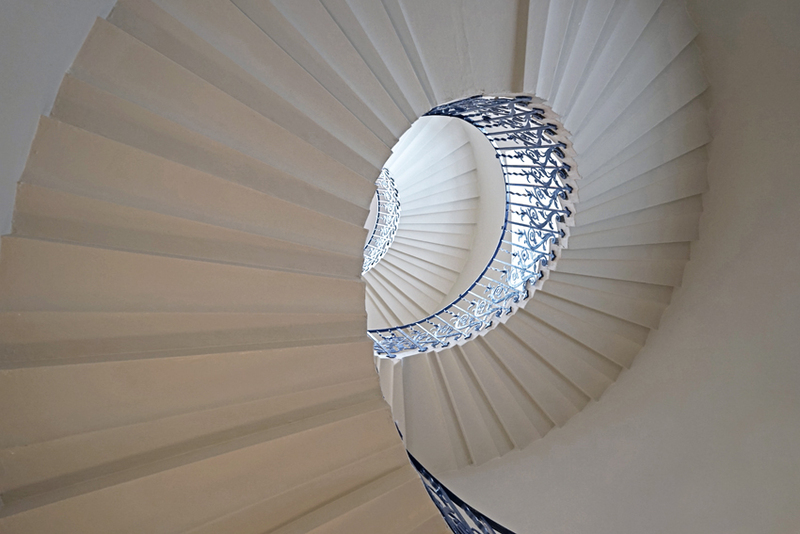 Stone's innovation allowed such staircases to be built more dramatically, yet remain structurally sound. 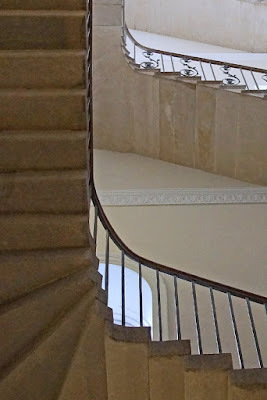 Geometric staircases proliferated in the eighteenth century, falling out of fashion only with the Gothic revival in the nineteenth. After the Civil War, the Palace of Greenwich in front of the house was demolished, giving it a view across to the Thames. When a new Hospital for Seamen was established on the palace site, Queen Mary II famously insisted that the river view must remain. Thus Sir Christopher Wren designed two pairs of courts, creating the riverside vista we are now familiar with - and leaving the Queen's House view unimpaired. It is now part of the National Maritime Museum, housing its art collection. 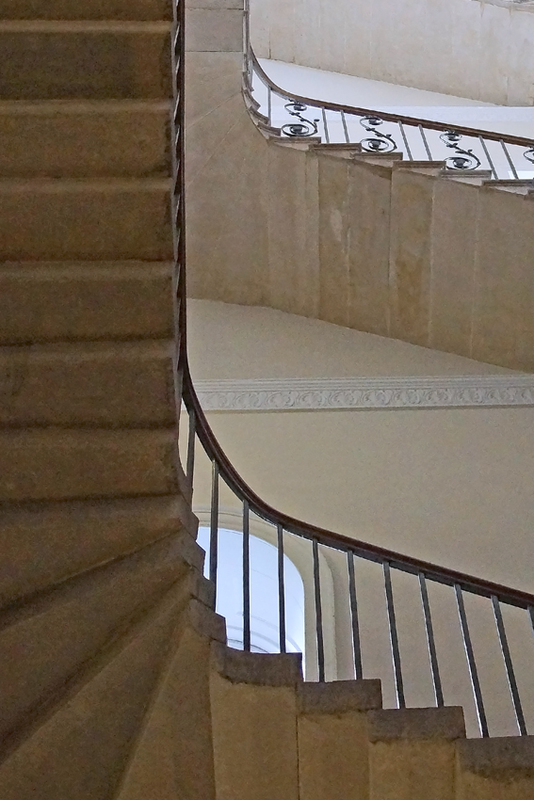 Visits are free, and worthwhile for the displays - but don't forget to look at (and climb) this fabulous staircase. 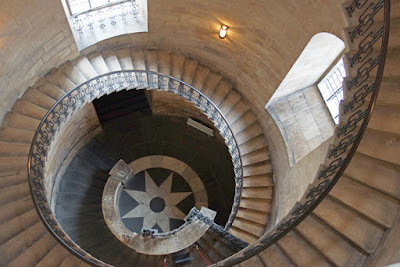 London has another famous seventeenth-century example: the Geometric Staircase of St Paul's Cathedral. A three-hundred-year-old masterpiece, which has starred in Harry Potter, it can be seen on the cathedral's Triforium Tour. 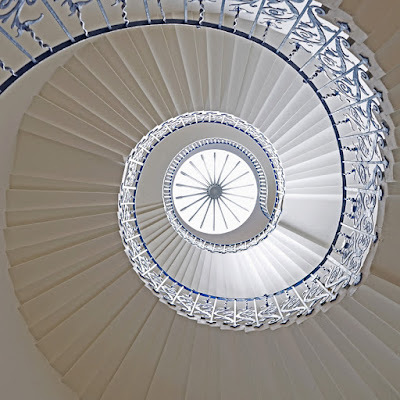 Apart from having very clever architectural design, this geometric, self-supporting spiral staircase is particularly lovely to stand below. 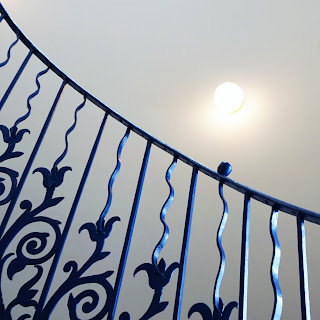 I say this for two reasons: a] The stylised flowers in the balustrade are delicately shaped and coloured. And b] the big glass dome in the roof floods the entire space in light. Exactly! 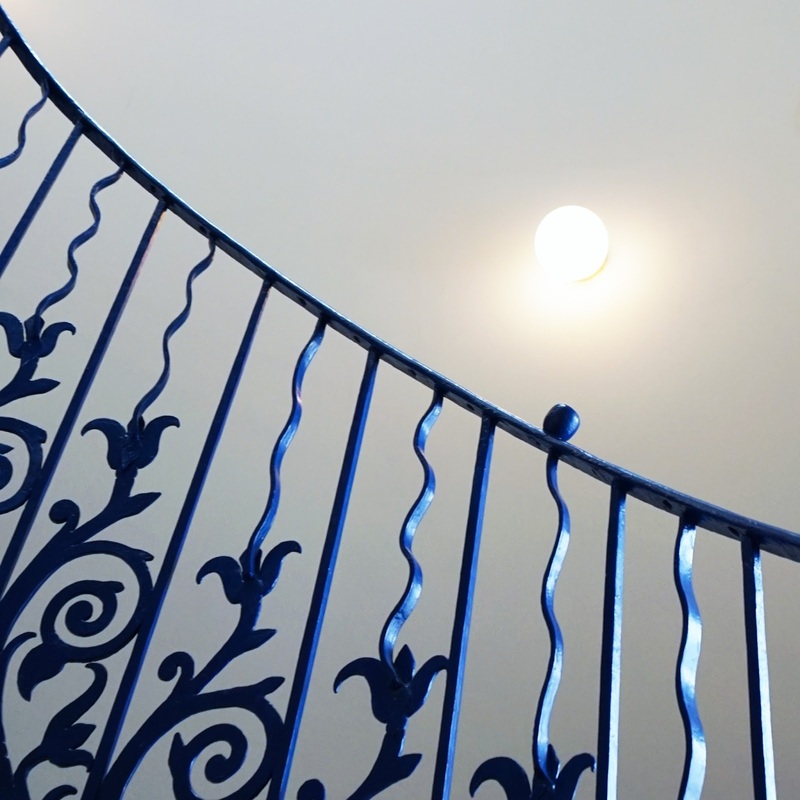 The ability to light the staircase from above was one of the reasons Palladio praised it. I'm always astounded by examples of ingenuity like this, and am slightly abashed to admit that I've been there and not noticed this feature. In the last few days I've been to the neolithic passage tombs at Newgrange in Ireland which were constructed from corbel arches and vaults. This entails layers of stone slabs which overlap the slabs beneath them, and don't tip into the gap because of the weight of the earth on the end of them. And this was about 500 years before Stonehenge was constructed. It makes me wonder what they might have done if they'd had carbon fibre or titanium to work with.